True Impact Performing and Visual Arts places education at the utmost importance. Our priority is to teach the "process" of each discipline, rather than focusing on the product. Owner and Director, Amy C. York, is degreed in dance education and performance and has trained students who have been successful in creating careers of their own. Our faculty has years of combined training and professional work in their fields allowing us to offer you the best arts education. We continue to seek learning opportunities through local and out-of-state workshops and complete research to keep our content current. TIPA considers skill level, experience, and age when placing students in classes. To encourage proper growth, students are not promoted until there is a demonstration of mastered skills. This class is specially designed for the 2 to 3 year old. The class meets one time weekly for 45 minutes and is taught in a mommy and me format. The class incorporates props, large loco motors, imagination, and preschool concepts such as turn taking, standing in line, colors, shapes, story time, fun, and more! Little Steps for Christ - Pre Dance for the child age 4 to 5. Little Steps for Christ is a once weekly 45 minute lesson designed for children age 3 and 4. This is perfect for the older toddler who is ready for the drop off formatted classes. The classes incorporate creative movement and baby ballet concepts. Our instructors use age appropriate terminology and lot of imagination when teaching this class. TIPA children's ballet classes are available for children 5 to 12 years of age who have successfully completed our pre dance program. Ballet level 1, 2, and 3 encourage proper ballet training. It's a priority to offer a tender, yet, educational approach that encourages proper skills and fosters etiquette. Level 1 students will be introduced to barre work after mastery of introductory skills. Levels 2 and 3 will practice barre and center work throughout the course of the school year. Hip Hop classes are taught to children ages 5 to 12, keeping modesty in mind. We strive to stay true to Hip Hop in its original form leaving out the negative influences of modern media. Our Hip Hop classes are great fun, creative, and are a wonderful cardiac workout for the active child. Our baton twirling classes follow the guidelines set forth by the National Baton Association (NBTA). Students will learn the history of baton twirling, jazz dance, and a pom routine in addition to baton twirling techniques. Teams participate in community parades and our Annual Spring Worship Celebration. Jazz/Tap combination classes are fun, percussive, and stylish. These classes encourage young dance students to explore creativity through imagination, music, and movement. Like all dance forms, children will grow athleticism while learning to perform and developing confidence. Our Picasso Kids Art curriculum is a wonderful way to let your child have fun while developing skills that will enhance their overall academic learning. We take pride in our "educational" approach to visual art training as we go beyond simple "paint by number" style approach while teaching dimension, shadow, color theory, and more. As students move through various art lessons they will be developing a love of art that enhances fine motor, problem solving, and communication skills. Their imaginations and creativity will begin to blossom and before you know it you'll have a little Picasso of your own! The children will display their work in an art exhibit during our annual Spring Worship Celebration. Ballet class level 4 and above includes a thorough study of the technique with full barre work, center work, and across the floor combinations. 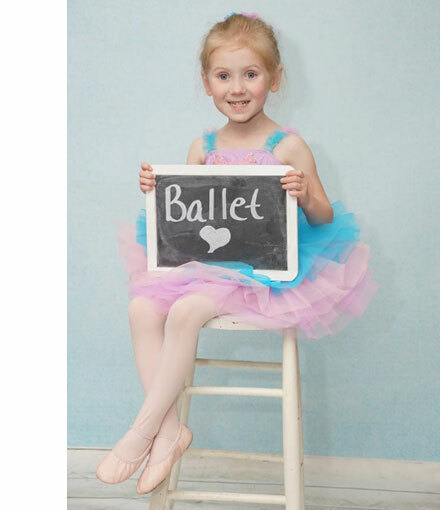 Children at the intermediate and advanced ballet levels will also study ballet history and French ballet terminology. Students will experience a steady progression of skills. Pointe class further the development of the ballet dancers feet. Available to students with instructors permission only. Modern Dance technique emphasizes freedom of movement and creativity while continuing to build body strength. Modern dance has become a necessary technique for aspiring professional dancers and is a wonderful outlet for recreational dancer's as well. Students experiment with percussive rhythms and choreography. Jazz/Hip Hop Combination class enables the student to study jazz, a popular upbeat musical theater technique that emphasizes suspension and fluidity, in addition to Hip Hop, a recently popularized dance form that is widespread among teens. The class is fun, upbeat, and provides a fantastic workout. Tap class is another musical theater necessity and is also great fun for the active teen. The class emphasizes percussive rhythms of the feet.